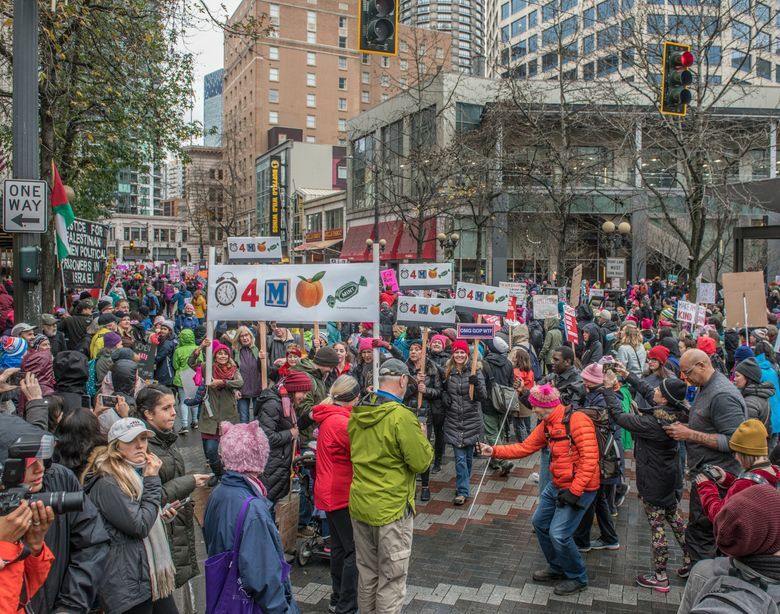 In 1953, an unnamed marching band paraded past businesses on Fourth Avenue; in January, the Seattle Women’s March filled the street. 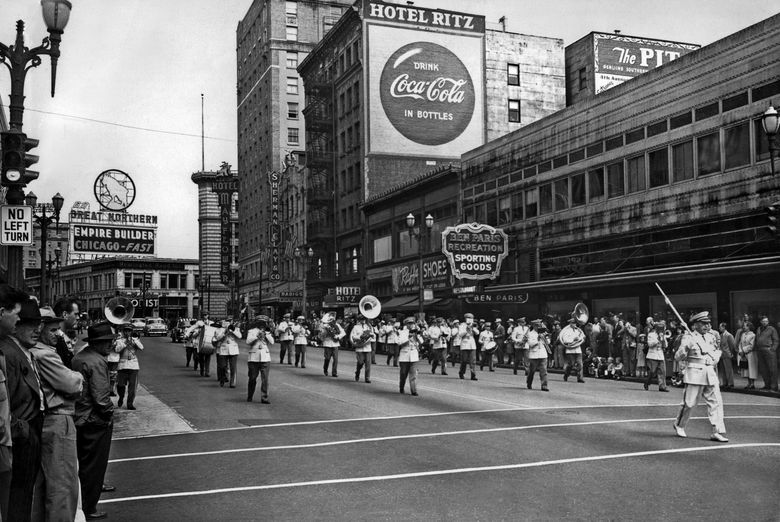 HERE WE COMPARE Jean Sherrard’s confident and colorful farrago of the recent Seattle Women’s March with a manly marching band heading south on Fourth Avenue 65 years ago. The baton-wielding leader in the “Then” photo is entering the crosswalk of Fourth’s intersection with Pine Street. We have not found the name for this marching band, but hope the uniforms might be clue enough for an astute reader to let us know. We do know the occasion: It is the Memorial Day parade of May 30, 1953. The block-long line of businesses on the east side of Fourth includes, right to left, the Ben Paris; Raff’s Shoes; the Hotel Ritz; the Up & Up Tavern; Sherman Clay Co. music store; and last, at the southeast corner of Fourth and Olive Way, the still-floating Mayflower Hotel. On the out-of-frame west side of Fourth, the Bon Marché department store was a point of prestige for its neighbors. Raff’s Shoes was, I think, an economy chain. I remember purchasing a pair of Raff loafers at its Spokane branch, also in the early 1950s. (I might still have them in storage.) Carpenters Local No. 131 built the Hotel Ritz in 1906. It continued to serve as a parody of the Parisian Ritz until well after World War II. Next door to the north, the Sherman Clay Co. was Seattle’s music mecca, selling not only instruments but concert tickets, too. The coastwide chain began in San Francisco around 1870. In 1929, when the ornate home on Fourth was about to open, its Seattle manager ironically boasted — just before the Great Depression — “It will be more than a store. It will be a very real Cathedral of Music.” Here on its marquee in 1953, more neon flash is given to radios than to pianos. The Seattle store closed in the fall of 2013. It was the last of the chain.